Senior living operators know that today’s discerning customers expect aesthetically pleasing, if not eye-grabbing, designs and furnishings that marry the look of “luxe hospitality” with “residential casual.” They also understand that prospective customers will turn to the competition if a community looks and feels dated, disjointed or otherwise uninviting. “Furnishings are very important. Not only do they add color and life to properties when combined with vibrant fabric choices and design details, furnishings send a message of comfort and can make a property feel like home, which is very important to both prospective and current residents and their loved ones,” says Anna England Chaney, lead senior living designer for Flexsteel Industries. Of course, attractive, space-unifying furnishings are only part of the equation. Furnishings must also be durable, comfortable, cleanable and safe for daily resident use. Fortunately, furniture and flooring manufacturers that cater to the senior housing segment keep adding innovative products to their portfolios that check all those boxes and more. When it comes to furnishing any senior living community, experts agree flooring is a wise place to start. The right flooring — in the right location — grounds the space, delivers security underfoot and can be a surprisingly lasting investment for the operator. The wrong flooring can trap odor, quickly show wear and tear and, most importantly, jeopardize resident and employee safety. Among the biggest challenges some operators face is focusing more on aesthetics and price than on how the product must function in each area, according to Jamie Thorn of Forbo Flooring Systems. Flooring needs in assisted living, for example, will differ from those in a memory care facility, where residents have a higher level of incontinence and visual and cognitive impairment. “Flooring should never be viewed as one-size-fits-all. You need the product to have a certain look, but it also needs to be durable, functional, comfortable and safe,” Thorn says. Another flooring expert echoed that sentiment. “There’s really no ‘bad’ product, just bad applications,” explains Ross Leonard, VP of marketing for J+J Flooring. He said operators looking to invest in new flooring should ask several key questions: Will the flooring limit mobility or contribute to glare? Will it require transitions that can lead to trips and falls? Will the colors or patterns be a barrier or risk for people with visual or cognitive impairment? How will the flooring need to function? There’s an ongoing trend by senior housing operators to integrate various hard and soft flooring products. Luxury vinyl tile is increasingly popular, thanks to its durability, affordability and fashion-forward designs. They can offer the look of wood planks, for example, but without the fussy upkeep and lofty price tag. Still, its application must be carefully considered because traditional vinyl plank flooring is thin and it is installed over a concrete subfloor, which limits comfort, notes Thorn. As an alternative, cushion-backed vinyl plank flooring is now available to enhance comfort and safety and aid sound absorption, he says. Although any vinyl product can lead to slips and falls when wet, Thorn says the cushioned vinyl product is especially well-suited for kitchen areas, where comfort and cleanability are essential. Due to its inherent comfort and acoustics benefits, carpet-style flooring still reigns supreme in senior living, although there’s a continued shift away from traditional broad-loom carpet that absorbs moisture and traps odors. Instead, more operators are eying innovative textiles that block moisture and odors, offer easy installation and maintenance, and allow for as-needed replacement. Operators installing a mix of soft and hard flooring throughout their communities must consider the safety risks associated with transitioning between the two. Even the slightest elevation changes between carpet and smooth surfaces like LVT or hardwood can pose a trip-and-fall risk, experts warn. Furniture made specifically for senior living is essential for resident comfort and safety, and for delivering the most return on investment. Unfortunately, some operators make the costly mistake of buying residential furniture from a local retail store. 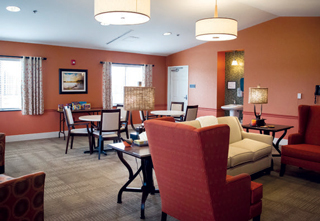 “As nice as the furniture may look, it’s not manufactured for senior care living,” stresses Linda Nash, interior designer at Invacare Interior Design. Typically, residential furniture is scaled larger and the dimensions do not comply to seniors, she says. One last piece of round for operators in the market for new furnishings: plan properly, explore all options and, when in doubt, seek the help of an interior design expert with senior living experience who can turn a vision into a comfortable, cost-effective and sustainable reality. “They can save [operators] money, make the environment marketable, keep the residents and family happy and save operators a lot of aggravation,” Nash assures.